He’s one of the longest serving political prisoners in the world. He has spent more than half his life behind bars. Puerto Rican Oscar López Rivera has been jailed for 35 years, convicted of seditious conspiracy because of his commitment to Puerto Rico’s independence. This, even though he was not charged or convicted of causing harm to anyone. López Rivera is serving a 70-year sentence, making him the longest-imprisoned political prisoner in Puerto Rico’s history. Oscar is 73 years-old, and will be 80 by the proposed date of his release in 2023. A grassroots movement with the support of a wide range of political, civic and religious leaders, artists and celebrities is asking president Barack Obama to release him before he leaves office on January 2017. Hamilton’s award-winning playwright Lin-Manuel Miranda, Nobel Peace Laureate Archbishop Desmond Tutu and US Senator Bernie Sanders have all made public appeals for his release. A petition has been created on the White House’s website: it needs to have 100,000 signatures by December 11, 2016, in order to be considered by President Obama. 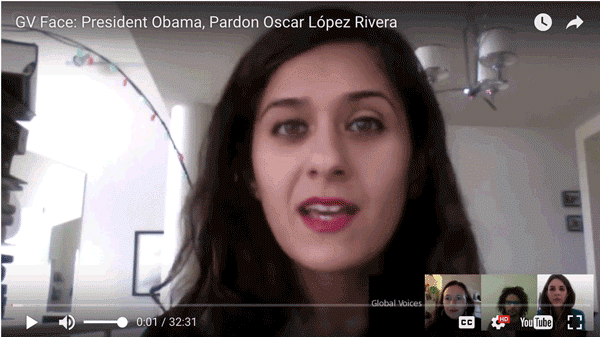 In this episode of the Global Voices Hangout series GV Face, we discuss the movement to pardon Oscar López Rivera with the team that covers Puerto Rico for Global Voices: Firuzeh Shokooh Valle, our Spanish Language Editor; Angel Carrión, musician and GV contributor; and historian and GV contributor Ana Gabriela Calderón.